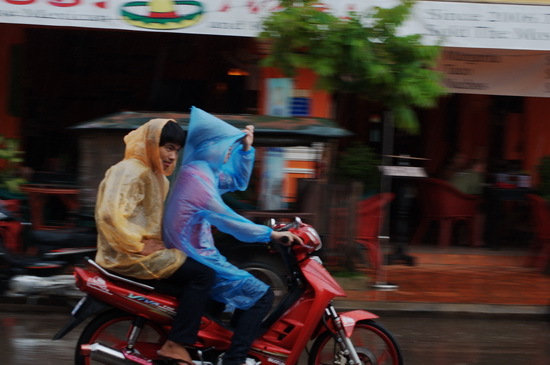 Sitting at home on a cold, wet drizzly day while pondering where to pursue adventures abroad, it may seem obvious that you wouldn’t want to go to Siem Reap during the height of the rainy season, but actually it’s not at all as people may imagine. In fact, it can be the best time of year to be here, largely because the number of other visitors tends to be lower. This makes visiting the temples a more pleasant exercise, means you may be able to negotiate on your room rate, and the restaurants and bars will be similarly less crowded. At the same time, almost all of the activities that were possible during the dry season are just as doable during the monsoon, although you may need to be prepared for the possibility of being rained out. But what about all that rain? Well, it’s not as bad as you’d think considering a whole six-month period is named after it; most of the time anyway. The rainy season normally runs from June to November though weather patterns have been pretty random in more recent years due to climate change. 2014’s rainy season was positively parched, while December brought some unusually heavy downpours. The big wet comes hot on the tails of the period from March until May when the temperatures here can soar into the 40s — provoking frequent power cuts — and for the most part consists of afternoon bursts that last from half an hour to an hour and bring blessed relief from the steamy atmosphere. It never just rains, it pours. As a general rule, the days tend to start off reasonably cool, with the heat climbing as the hours add up, getting warmer and more humid until you finally feel the stirrings of a faint breeze. This should be your cue to find some place you won’t mind being stuck in for an hour, and you’ve got 20 minutes to half an hour to find it. The first flicker of lightning is your five-minute bell. The show consists of lakes of rain being dumped, spectacular lightning cracking open the sky and thunder that sometimes sounds like someone’s just fired off a rifle beside your ear retorts. 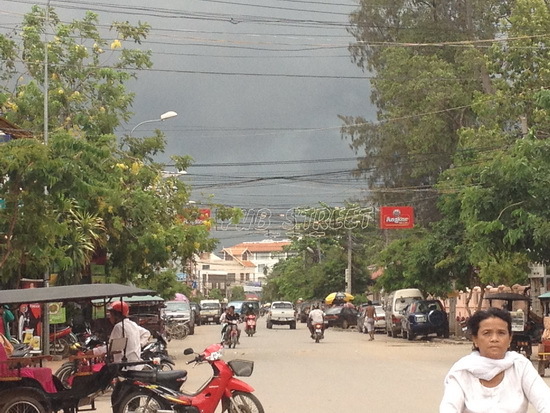 Sometimes, it really is right beside your ear and lightning deaths in Cambodia are a huge problem, mainly for field-workers. Not to be left out, the wind also kicks in, thought not usually at a sufficient level to do damage. Rain coats and wind — by a professional. 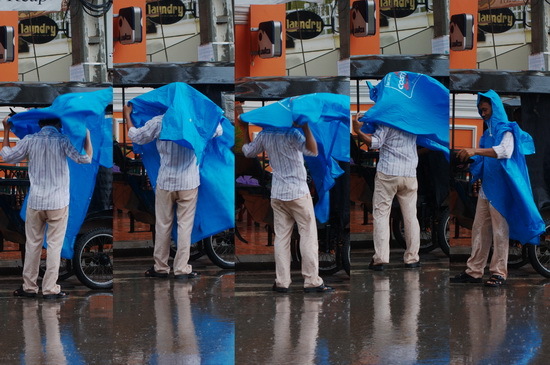 If you’re still out and about, cheap, plastic, condom-like raincoats help, and usually cost about 2,000 riel from streetside shop stalls where you can see them hanging up. They weigh nothing, take up very little space in your bag and are often a better option than carrying around a clunky umbrella. Putting them on without ripping the thin sides though is sometimes an art. And then it just ends, usually after about an hour, and the transformation is blissful. The temperature has dropped, everything sparkles, the light is lovely and the air feels softer, cleaner and less humid. It’s not always like that though. September and October 2011 saw horrific flooding across Cambodia that killed hundreds and displaced thousands — families are still struggling with the consequences years later. This kind of disaster at this time of year is not unprecedented; 2002 was just as bad. 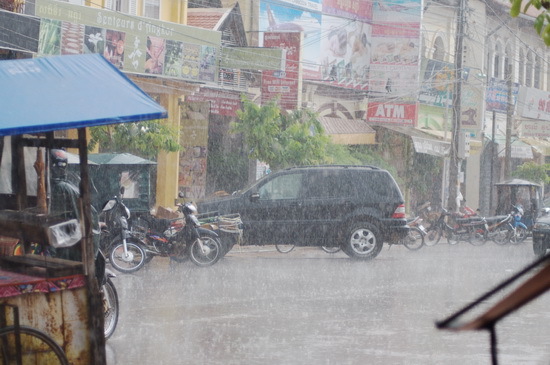 And in 2010 we also had Typhoon Ketsana, which left Siem Reapers wading up to their knees for a week. When's the best time to visit Siem Reap?